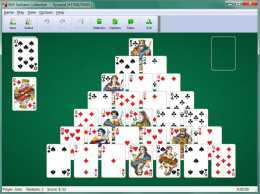 A collection of 370 multi-featured, very different solitaire card games to play. You will be able to learn solitaires not found elsewhere. BVS Solitaire Collection gives you the plethora of statistical and scoring screens. You can track your performance and progress in playing solitaire about as completely as many people use a computer to track their finances. And you can publish your personal statistics on the BVS Solitaire Collection web site to appear in the top scores list.